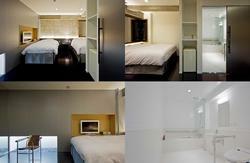 Ryokan Maizuru is located in one of the busiest areas in downtown Tokyo. 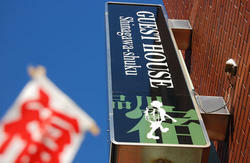 It is only 7 or 8 min walk to Kita-Senju Station, which has great access to almost all famous spots in downtown Tokyo. We have 2 floors, and 8 guest rooms in total. All rooms are Japanese style. The rooms are clean and cozy. The size of the rooms ranges from 4.5 tatami mats to 10 tatami mats. Up to 4 guests can stay in the biggest room. We have a nice little Japanese garden, and it is nice to view the garden from some of the guest rooms. The shower room and bathroom are shared by all guests. We keep them very clean. We have a hot-tub, where you can reserve for private use. Hope you enjoy soaking in a Japanese style bath. If you wish to have breakfast at the ryokan, which is mostly western style, please make a reservation in advance. We offer free coffee, tea or Japanese green tea at the lounge on the first floor. The tea facilities, microwave oven and refrigerator in the lounge are shared by all guests. If you are not in Tokyo, please first go by train or by air to Tokyo. When you are in Tokyo area, take a train on JR Jyoban Line, or subway Chiyoda Line or Hibiya Line to Kita-Senju Station. Get out the west exit of Kita-Senju Station, and walk west to Nikko-kaido (Rt.4) direction. At the Tsutaya video shop intersection, turn right and walk pass Seven Eleven Convenience Store until you see Mini Stop Convenience Store on the left. Turn left at the intersection, and walk again towards Rt.4 direction. We are on the left side of the street, right before you reach Rt. 4. We are about 650 meters from Kita-Senju Station, and it takes around 7 or 8 minutes to walk from the station. Please refer to the map in our photos.